A cheap-and-cheerful golf club and course. Situated at the top of Riviera, between Calahonda and Mijas. This is a densely built-up mid-market area. Not particularly luxurious, but comfortable. There is plenty of property surrounding this golf course. Mostly apartments, some small villas. The club is 25 years old, so most of the property was built before the excesses of the Spanish real estate boom/bust (when apartments became increasingly boxy, mean and unattractive) so is varied and nice. None of the property intrudes near the course, although there is plenty of it in sight as you go around the course. Membership of the club is mostly Scandinavian, with some other Europeans and a small Spanish contingent. Membership deals are quite inexpensive by Costa del Sol standards, and the cost of a round for a visitor is low. Definitely in bottom 5 price-wise of all 18-hole golf courses on the Costa del Sol. The clubhouse is mid-sized and attractive in a simple style. Parking is OK, but on a very busy day might be a bit restricted. I found all staff very polite and helpful. The Menu del Dia I had there for around €10 was fine and service very attentive. The Miraflores course itself has about 6 holes with reasonable elevation (up/down towards the green) and slope (left-to-right or vice versa across the fairway). The remaining holes are quite flat. There are 5 dog-legs, of which two are quite severe. 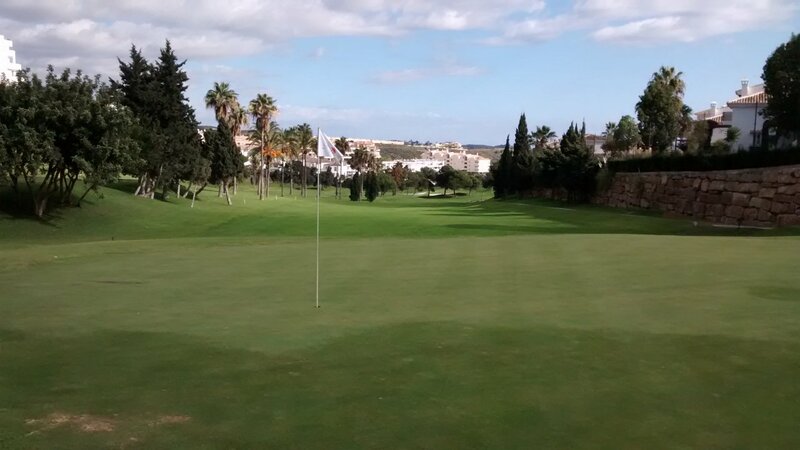 This is one of the shortest courses on the Costa, so even a true dog-leg is not difficult. There are a few lakes, but those are not really in play unless you duff a shot badly. Bunkers have quite coarse-grained sand, but still play well i.e. are easy enough to get a sand wedge under the ball. The number and location of fairway bunkers is not tough. Fairways are good quality, with a small number of unrepaired divots. 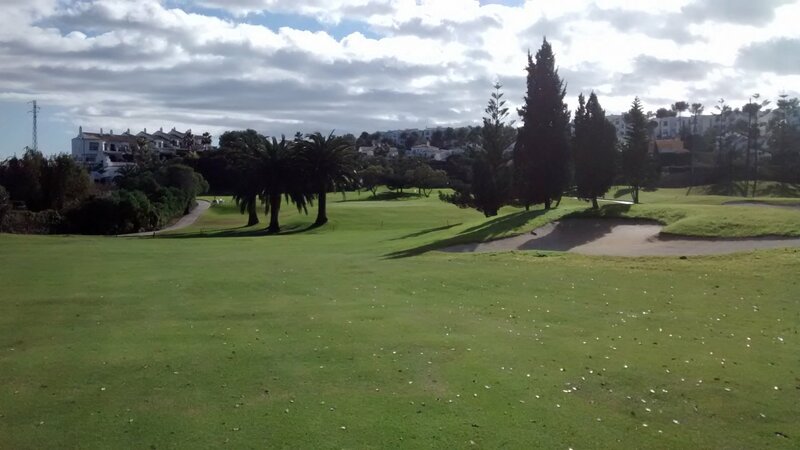 The fairways are medium width, not generous width, and are lined by mature trees (notably quite a lot of palms). There is no real rough to speak of – all grass on the course is cut quite low. The tee-boxes are grassed in the same way as fairways, so also good quality. Only a few holes run alongside each other – where an errant drive might end up on an adjoining fairway for example. The greens are quite large and medium-fast speed. Some have moderate slope, some have severe slope. Not difficult to read the line of a putt, but quite difficult to read the pace of the putt. The greens are also quite hard, often elevated and have a bunker guarding the front of the green, so not easy to get an approach shot near to the hole. Overall, fairly easy up to the greens (particularly as a short course with decent fairways) then more difficult once you get within range of the green. Miraflores is absolutely not a premier course and is priced accordingly. There is enough variety in the holes on this course to make it interesting, but it is simply not long enough to be a serious challenge to low-handicap golfers. A tricky course – certainly not easy. I suspect the average golfer going around Miraflores has handicap about 20, and this is a good course for players with handicap up to 30. Players with very high handicap, or real beginners, can still enjoy this course although they might find a flatter course better to learn the game. I personally would not walk this course, but many players do. I always recommend you take a buggy the first time you play any golf course - your definition of a "nice walk" and mine may differ substantially. There are very simple concrete hole maps on each tee, and the scorecard has a simple course plan on it. These maps are enough to get you around the course, although no real help on distances. This club has its price point and attracts a level of golfer who wants that price/quality trade-off. I do get the feeling, by the way, that Miraflores is fundamentally a happy club. Not a regular course for me as a frequent golfer, but a good course for casual golfers and those who want to concentrate on position rather than length of their shots. As I say, "cheap-and-cheerful" very accurately describes this club and course. 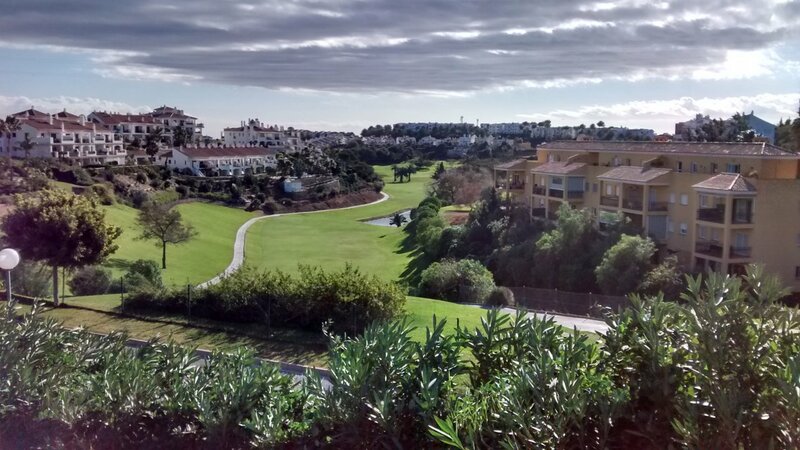 The location in a densely built-up central area of the Costa del Sol means it should always get visitors looking for a simple, fun round of golf at a good price. Review last updated: January 2015. Number of times played: 5. Miraflores is represented by the yellow dot. This shows that Miraflores is one of the very shortest courses on the Costa del Sol, and is quite a bit easier than the average course down here. An 18-handicap player can expect to go around this course between 18 and 19 over par.